Amid demonstrations, terror threats, and hyperbolic headlines, France has become the first Western country to enforce a ban on face-covering attire in virtually all public places, more than six months after the Senate approved sweeping legislation. Penalties for wearing garments such as burqas and niqabs include a fine of €150 and citizenship classes, while those who intimidate others into donning the apparel risk a €30,000 assessment and a year in prison. Tickets are being issued, but questions persist about legal challenges and enthusiasm to administer the law. Australia. The cabinet of New South Wales declined to endorse a ban in August 2010, though calls for such measures continue at various levels of Australian government. Belgium. The Chamber of Deputies passed a French-like ban last April, but a government collapse prevented its ratification by the Senate. 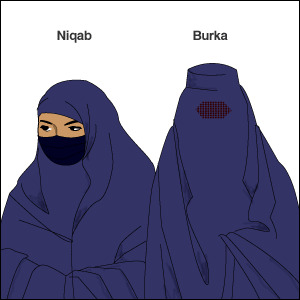 In January, a court refused to enforce a burqa ban in a district of Brussels, prompting the reintroduction of nationwide legislation, which a committee of Belgium's lower house approved last month. Canada. Bill 94, requiring that those who receive or provide public services in Quebec show their faces, remains stalled in the provincial parliament. Germany. In February, the state of Hesse announced a prohibition on face veils for government employees after an office worker returned from parental leave demanding to wear one. Reportedly other German states are considering similar codes. Italy. A parliamentary bill patterned on the French law was introduced last September, but apparently it went nowhere. Further, lack of news suggests that the policies of several towns to fine face-covering women under an old terrorism statute remain intact. Netherlands. Geert Wilders predicted that the governing coalition would push for a burqa ban in exchange for his party's support, but no concrete actions have been taken to date. Spain. Lerida, the first town to bar the burqa in public buildings, implemented the ban in December, but a judge halted it due to a lawsuit. Plans are on the table in Barcelona and elsewhere. Catalonia's parliament and the national one both rejected legislation in 2010. Switzerland. The council of Aargau canton voted to "work on a state initiative" to outlaw the burqa in public last May, but there has been no news since. In addition, a federal panel on gender issues recommended that face veils be nixed at government facilities. France "lives with its face uncovered," one ubiquitous poster declares. As surveys and the above efforts indicate, many other Westerners are intent on having their countries live the same way.